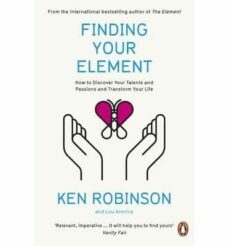 Ken Robinson, author of the international bestseller The Element and the most viewed talk on TED.com, offers a practical guide to discovering your passions and natural aptitudes, and finding the point at which the two meet: Finding Your Element. The Element has inspired readers all over the world to change their lives and this new companion is a practical guide containing all the tools, techniques and resources you need to discover the depth of your abilities and unlock your potential. Among the questions it answers are: How do I find out what my talents and passions are? ; What if I love something I'm not good at - or I'm good at something I don't love? ; What if I can't make a living from my Element? ; and How do I do help my children find their Element? No matter what you do, or where you are in life, if you're searching for your Element, this book will help you find it. "Relevant, imperative...It will help you to find yours". (Vanity Fair). "Happiness really is within your grasp". (Guardian). "Leads readers to a place where natural aptitudes and abilities converge with one's passions:. (Kirkus Reviews). Sir Ken Robinson, PhD, is an internationally recognized leader in the development of creativity, innovation, and human potential. He advises governments, corporations, education systems, and some of the world's leading cultural organizations. The videos of his famous 2006 and 2010 talks to the prestigious TED Conference have been seen by an estimated 200 million people in over 150 countries. Lou Aronica is the author of two novels and coauthor of several works of nonfiction, including The Culture Code (with Clotaire Rapaille) and The Element.